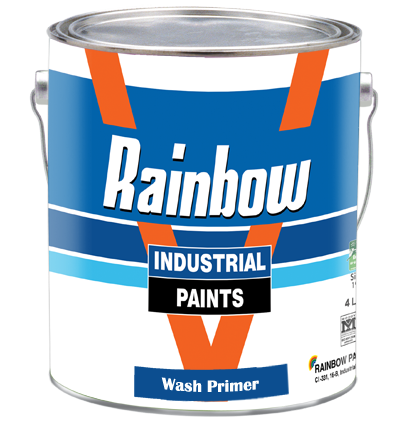 Rainbow Wash primer is a two pack (acid based) product for treatment of aluminum & galvanized surface for subsequent paintings. Covering Capacity: 15 sq meter /Ltrs. Mixing Ration: 1:1 by volume Base paint and catalyst (Harder). Pop Life: 8 hours after measure. Film Tickness: Must not exceed 8 micron (DFT). Packing: 4 Ltrs. Paint & 4 Ltrs. Hardener. Colour: Greenish yellow.